Even though the Annual Meeting of the American Society of Clinical Oncologists or ASCO is only a month away, there is still much valuable information to share from the ASH 2012 Annual Meeting six months ago and there is no one better than Dr. Adrian Wiestner from the NIH (NHLBI) to teach us. At the upcoming ASCO meeting, there will undoubtedly be fresh reports that improve our understanding of the underlying biology and treatment of chronic lymphocytic leukemia (CLL), but let us pause to remember just how quickly the treatment landscape is changing by taking some parting glances at the data from ASH 2012. Let me explain what I understand to be the main differences between ASCO and ASH, two giant cancer conferences vying to attract the best groundbreaking research papers and the oncology crowds that follow them. I have been attending the annual meetings of the American Society of Hematology (ASH) for many years. Approximately 15,000 hematologists from around the world meet every December in major American cities offering a convention center big enough to handle the crowds and interesting enough diversions for the docs and their families. Last year it convened in Atlanta; this year we’ll converge on the Big Easy. ASH emphasizes an exhausting array of exciting basic laboratory research, in addition to the clinical trial data and many practical “how to treat” symposia. This upcoming conference will be my first ASCO meeting. ASCO, as the name suggests, is more clinical in its orientation and much bigger. Gimongous! At twice the size of ASH, the 30,000 attendees annually trek to Chicago where the McCormick Place Convention Center has room for them all. Wear comfortable shoes because there will be a lot of walking. Plan your days carefully and pick a track on breast cancer or brain tumors and be prepared to run from room to room. My chief interest of course remains my personal torch, CLL; but I also plan to expand my reporting on other B-cell lymphomas specifically, and hematologic cancers in general, with some important diversions to cover the latest on a few common solid tumors. What I don’t yet know is how much will be revealed at the ASCO meeting about the emerging basic lab science related to CLL, especially the importance of clonal evolution and the critical role of the microenvironment. What I do anticipate is more mature clinical trial data on ibrutinib (PCI-32765), idelalisib (CAL-101), ABT-199, and GA-101 and also a host of preliminary studies on other TKIs (tyrosine kinase inhibitors or small molecules, usually oral meds, that block pro-survival pathways in cancer) and the new mAbs (monoclonal antibodies trying to improve on rituximab) that are in early development. What is the durability of the response? What have we learned about the significance of the almost universal finding of a low level of residual disease with these new TKIs? What do we know about the longer term adverse event profiles, including the risk of Richter’s Transformation, secondary cancers, immune function, and infections? Maybe most importantly, what have we have learned from the few CLLers who have relapsed? Who are they? What are the risk factors? Is there anything we can do to improve the already good odds? Concerning the newer dugs and the mAbs, I want to hear which pathways offer us the best promise of a lengthy trouble-free survival. I posed some of these same questions last December at ASH 2012 and there is no one better to teach us than the thoughtful Dr. Adrian Wiestner from the NIH. His deep, inventive, commercial free, and government-sponsored research includes a focus on non-chemo approaches to CLL. Ibrutinib specifically, and kinase inhibitors in general, all induce dramatic responses in CLL with a very favorable adverse event profile. That is great news for all with CLL, but especially those with difficult to treat disease, such as those of us with 17p del or refractory disease. In the first part of my ASH 2012 interview, Dr. Wiestner discusses some of what is known and what questions he is hoping to answer. You get a sense of why he is so exited about these new lines of therapy. And he correctly predicted the rapid enrollment in the phase III RESONATE trials comparing ofatumumab and ibrutinib. It just closed accrual with its 350 subjects, every one of whom deserves our gratitude. On a personal note, I remain with my mild iron deficient anemia. Maybe that explains my increased fatigue. The rest of my lab remains super. I am off to OSU today for yet more lab, more ibrutinib, and radiotherapy also known as CT scans. Only kidding, but CTs every 3 months is excessive! The treat on this trip besides the Mark Rothko exhibit at the Art Museum in Columbus and seeing old friends and smelling the spring flowers at the Metro Parks, is that I get to tour Dr. Byrd’s lab and the new cancer hospital under construction (again sensible shoes and this time I will need a hard hat), meet some other CLLers, and best of all, have a chance to break bread with Drs. Byrd and Flynn. More soon from Dr. Wiestner from ASH 2012 and prep for ASCO 2013. I saw the real Fab Four in 1966 at Maple Leaf Garden in Toronto, a place built for hockey, not music. I say saw because all I heard was the screams of the teenage girls behind and in front and beside me standing on their chairs and yelling at the top of their lungs from the instant the boys walked on stage until the ran off, after a very short set. I can't recall one song that they played. It was memorable moment of Beatlemania and earns me bragging rights to this day, but from an esthetic perspective, it was a debacle. I remember that Bobby Hebb (of Sunny fame) and the Cyrkle (Red Rubber Ball) opened the show. They were both very good. The late Frank Zappa of the Mothers of Invention famously said that if music was a competitive sport, then perhaps it would have arenas built specifically for it. We are still waiting for that day, Frank. The Fab Four, probably the very best Beatles tribute band with the eerily identical Ed Sullivan impersonator introducing the lads from Liverpool, was a much less historic, but more pleasing evening. The band played everything live, had a wonderful Liverpool banter going, nailed the nuances of the originals' stage presences, and when I closed my eyes, I was hearing the Beatles, live. It was total fun and we danced two feet from the stage. We were too busy remembering the 60s to do much filming so check out the FAB's website if enjoy these teases. Better, yet catch them live. We had a splendid time. Thanks to my young friend Alec of the Anglomaniacs for turning me on to this special experience. Alec and I met because of the Beatles watch that I always wear for good luck and high platelets (See JBMA or Journal of the Beatle Medical Association 1960-1970 by Drs. John, Paul, George and Ringo on the Positive Effects of Wearing Beatle Paraphernalia on Various Blood Indices). Who says that those who can remember the 60s weren't really there? Not true. This is the article that discusses my clinical trial. My photo with Dr. Byrd is on the cover on the magazine and I was interviewed for the text. The writer, Kendall Powell made everything so easy. I pasted the full article below, but the whole online journal is worth reading. I got no end of teasing from my oncology colleagues about the picture of Dr. Byrd and me on the cover. Dr. Kipps was especially sweet in his comments. The same issue of Frontiers contains this worthwhile article on Dr. Byrd's research on page 9 of the PDF version on the journal. It can be a bit slow to load, but it's worth the wait. Lots of other interesting reading for those interested in how the darkness in being push back in CLL in particular and cancer in general. I particularly enjoyed in the article on page 8 on inflammation and its role in the the rare lymphoma, LGL. Later this month, I will be back in Columbus for more CT scans and lab tests, but I will also have the special opportunity to visit the research lab. I am anticipating learning much about cutting edge technology in interrogating cancer calls and the body's responses. As much as I love the folks at the James, it has been nice to have my 84 days away. Multipotent hematopoietic stem cells (HSC) give rise to healthy B lymphocytes. Recent evidence suggests that genetic changes at the HSC level lead to monoclonal B cells that then give rise to CLL cells. Enlargement: The experimental oral agent ibrutinib blocks B-cell receptor (BCR) signaling, thereby preventing B-cell activation and proliferation. Ibrutinib binds irreversibly with Bruton’s tyrosine kinase (BTK), a protein that is overexpressed in CLL and other B-cell malignancies. This blocks signals from the B-cell receptor that are essential for CLL-cell survival and proliferation and triggers cell death. A few days before Christmas 2011, physician assistant Margaret Lucas walked into her chronic lymphocytic leukemia clinic to see a dozen patients and for a moment wondered if she'd entered a flu vaccination clinic by mistake. The patients were smiling, looking well, all had their hair and no one was fighting an infection or required a blood transfusion. "Nobody needed anything from me," she recalls. "It was really overwhelming." They did need one thing: refills of their once-daily dose of the pill that was keeping these relapsed leukemia patients healthy. That day was in stark contrast to the usual clinic day. Chronic lymphocytic leukemia (CLL) is a highly heterogeneous malignancy that typically requires a mix of treatment options depending on the individual. Many newly diagnosed patients have an asymptomatic, indolent form of the disease that requires close monitoring only, sometimes for many years. Often, a routine blood test reveals the abnormally high lymphocyte count and leads to diagnosis. Median survival can exceed 10 years. Other patients have an aggressive form of CLL that requires immediate treatment. Survival for these patients is about one or two years when untreated and two to five years when treated. "CLL is the most common and prevalent adult leukemia in the Western Hemisphere," says John C. Byrd, MD, a CLL specialist and professor of Medicine, of Medicinal Chemistry and of Veterinary Biosciences at The Ohio State University Comprehensive Cancer Center - Arthur G. James Cancer Hospital and Richard J. Solove Research Institute (OSUCCC - James). "More than 100,000 people in the U.S. are walking around with it, and it is not curable with current therapy. The median age at diagnosis is 72, and nearly 4,600 patients were likely to die from CLL in 2012," says Byrd, who co-leads the CLL Experimental Therapeutics Research Laboratory. CLL is believed to begin as a premalignant disorder of B lymphocytes called monoclonal B cell lymphocytosis (MBL). Additional gene mutations in B cells or signals from the bone-marrow microenvironment probably drive progression of MBL to CLL and result in the proliferation of ineffective B lymphocytes that lead to abnormal immunoglobulin production and autoimmune disorders. With progression, CLL cells crowd into lymph nodes and the spleen and liver, painfully enlarging those organs. The disease disrupts red-blood-cell and platelet production, leading to anemia and bleeding. Treatment with traditional chemotherapy drugs could keep the disease in remission for a while but does not improve overall survival. In the late 1990s, drugs with greater activity against CLL were developed. They included rituximab, a monoclonal antibody designed to target leukemia cells, and fludarabine, a purine analogue that destroys both B and T cells. These agents produced more frequent and longer remissions, but the disease eventually recurs and usually resists further treatment. Currently, there is no curative therapy for CLL, other than possibly a high-risk hematopoietic stem-cell transplant. Moreover, CLL is associated with a wide range of potentially fatal hematopoietic and immune-system complications. A common first-line treatment combines fludarabine, the alkylating agent cyclophosphamide, and rituximab. This regimen, called FCR, has a 70-percent complete-remission rate, but almost all patients eventually relapse, and FCR often worsens the hematopoietic and immune-system complications. Unfortunately, patients over age 65, who represent about two-thirds of the CLL population, generally cannot tolerate FCR treatment because it puts patients at high risk of respiratory and other infections. Instead, older patients may be treated with drugs such as chlorambucil and rituximab, though these agents are less effective at producing lasting remissions. "We need newer therapies for older patients - therapies that keep patients in remission longer and don't have the immunosuppressive side effects of chemotherapy," Byrd says. 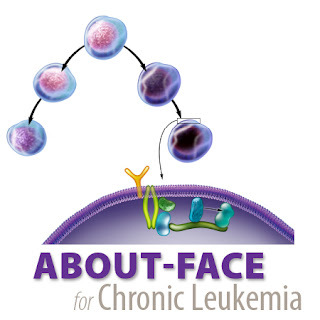 "Our quest is to identify targeted therapies that selectively kill leukemia cells." Ibrutinib (or PCI-32765) has the potential to fulfill all of Byrd's requirements. Pharmacyclics, based in Sunnyvale, Calif., licensed the drug from Celera Genomics in 2006. Recognizing the OSUCCC - James group as a leader in preclinical research and early-phase trials of new drugs for CLL, Pharmacyclics approached Byrd and the OSUCCC - James CLL Experimental Therapeutics Laboratory about testing ibrutinib. Ibrutinib belongs to a class of drugs called B-cell receptor (BCR) antagonists. The B-cell receptor is overexpressed in CLL, and BCR signaling is essential for B-cell maturation and growth. Having already tested another B-cell agonist, CAL101/GS1101, that was proving to be effective in early clinical testing, the team agreed to put ibrutinib through the same preclinical paces. Ibrutinib binds to and inhibits a molecule called Bruton's tyrosine kinase (BTK), a protein that is essential for BCR signaling and is overexpressed by CLL cells. By inhibiting BTK, ibrutinib prevents BCR signaling and B-cell activation, says Amy Johnson, PhD, a research assistant professor in the Division of Hematology and a molecular pharmacologist. "But when we expose CLL cells to ibrutinib in lab dishes, they don't instantly die. When we first saw this in the lab, we were kind of worried because ibrutinib is not highly cytotoxic," she says. "We learned there is more to it than that." The team pushed ahead with experiments to test ibrutinib in CLL cells and mouse models. In a2011 paper published in the journal Blood, the group showed that CLL cells overexpress BTK, that ibrutinib makes CLL cells more susceptible to apoptosis compared with normal B cells, and that the agent had no toxic effect on T cells. Ibrutinib also quashed the proliferation of BCR-activated B cells and shut down their survival pathways. Finally, their laboratory studies showed that the drug blocked survival signals that CLL cells receive from the microenvironment, including IL-6, IL-4, TNF-α and stromal-cell contact. In subsequent research, Johnson tested ibrutinib on a mouse strain that spontaneously develops a CLL-like leukemia at about nine months of age. (The mice carry B cells that overexpress a human oncogene called TCL1.) "If we provide continuous treatment with ibrutinib starting when they are really young, we can prevent the leukemia from developing," says Johnson. In another experiment, the team transplanted the leukemic cells from the TCL1 mouse model into 100 mice without leukemia. Then, at the time of leukemia diagnosis (by flow cytometry), they gave the mice ibrutinib daily in their drinking water. The treated animals had a significantly longer overall survival than control animals at 46 days versus 24 days, respectively. Using mouse genetic models, the team has also shown that BTK is indeed a critical target in the development of CLL. In both mice and humans, a mutation that knocks out the function of BTK causes the immune deficiency hypogammaglobulinemia. Johnson and her team crossed the mouse with the mutated BTK gene with the TCL1 mouse. The resulting offspring, which in essence are predisposed to develop CLL but have BTK permanently disabled, do not develop the leukemia at nine months as usually happens, and most were behaving normally and appeared free of side effects after more than 12 months. "So we've shown that inhibiting BTK - both pharmacologically and genetically - prevents leukemia from developing in mice," says Johnson. In the meantime, clinical testing of ibrutinib was moving forward. In 2010, trials began in patients whose CLL had relapsed and was refractory to other treatments. In phase I and II trials, cohorts of CLL patients experienced a 90-percent response rate in terms of shrinking lymph nodes, spleens and white blood cell counts, and improving anemia. In 70 percent of patients with relapsed disease, ibrutinib removed detectable CLL cells from the blood, with a partial response or better, Byrd says. "Ibrutinib has really opened up a door of hope for people," says Lucas. Turnarounds like those of her Christmastime-clinic patients were characteristic of most patients put on ibrutinib. "It's dramatic," she says. One such patient is Brian Koffman, a family physician who lives in Newport Beach, Calif. The 61-year-old has been living with an aggressive variant of CLL for seven years. He underwent a stem-cell transplant and rituximab therapy, both of which failed. A complication called autoimmune thrombocytopenia made pursuing the harsher therapies, such as FCR, a high-risk choice. At one point, he grew a "Santa-beard" to hide his massively swollen lymph nodes from his own patients. After participating in the phase II ibrutinib-plus-ofatumumab trial for eight months, his lymph nodes are no longer palpable and his blood work is "boringly normal," he says. "What's most notable about ibrutinib is that, with more than two years of follow-up, the median time to relapse has not yet been reached. The drug - a pill taken daily - is holding people in remission," Byrd explains. And the side-effect profile of ibrutinib? "Compared to most new chemotherapy drugs, it's apples to oranges," Byrd says. Koffman had some mild diarrhea, heartburn and a couple of rashes. All typical, he says. "Overall, taking the medication is a non-event." Fatigue and bruising are also common. Even though the trial requires him to fly to Columbus frequently, Koffman calls his participation "one of the best decisions I've ever made." Because the trial in relapsed patients has gone so well, and because the drug does not appear to increase infection risk further in CLL, Byrd wanted to move ibrutinib into a trial for first-line treatment of patients over 65, giving it as monotherapy. The results in this previously untreated, over-65 patient group are "similarly spectacular," Lucas says. At 27 months, 96 percent of this group of 31 patients was progression-free. "With chemotherapy, we would expect this to be about 50 percent. "People are using the word revolutionary to describe ibrutinib - we have never had a medication that worked so well with so few side effects." Byrd, who typically speaks in measured, reserved tones, also cannot hide his enthusiasm: "It's beating the socks off other treatment options. This class of drug is going to transform CLL just as Gleevec did for CML," he says, referring to the molecularly targeted drug for chronic myelogenous leukemia. Byrd doesn't use "transform" lightly - he and Lucas have seen patients' lymph nodes and spleens shrink within the first week of treatment; patients who thought they were headed for hospice care instead head out on cruises and trips to Europe. Simply put, says Byrd, "It's an amazing drug." Ibrutinib could be game-changing for the treatment of end-stage CLL, which too often is a frustrating act of moving patients from one therapy to the next and hoping for the best. “With ibrutinib, we have some patients on their second and third years of treatment with no relapses," Lucas notes. Byrd cautions that resistance could occur in the future. And even though the numbers of patients who have relapsed on ibrutinib or who cannot tolerate the drug are very small, doctors need a next-drug in the arsenal to offer those patients. This might be an improved, second-generation BTK inhibitor (akin to dasatinib and nilotinib for Gleevec), he explains. Lab researchers will investigate the question of resistance and what happens when mice stop taking the drug. Clinicians want to know if ibrutinib, which also kills healthy B cells, will cause long-term immune suppression and whether the drug has benefit for treating early-stage CLL. Currently, ibrutinib is entering phase III testing for both previously untreated CLL and for relapsed patients. In the RESONATE trial taking place in 44 centers around the world, 350 relapsed or refractory CLL patients will be randomized to receive either ibrutinib or the monoclonal antibody drug ofatumumab. In the RESONATE-2 trial, 272 patients 65 or older with previously untreated CLL will be randomized to receive either ibrutinib or chlorambucil. Byrd has conducted translational studies of CLL for 15 years, moving from laboratory bench to patient bedside and back to the bench, working to improve CLL treatment. Lucas has worked with him that entire time and says ibrutinib is unlike anything they have seen before. "I've seen Campath, rituximab and fludarabine as they were introduced. They can make patients incredibly sick and vulnerable to fatal infections," she says. "The more specifically targeted agents that we can find for malignancies, the better." My friend, Wanda had a particularly nasty form of CLL. I say had, because she has been disease free for long time, all because of the kindness of a stranger who is a stranger no more. Wanda had had a difficult time with her cancer. Her leukemia had resulted in multiple hospitalizations include at least twice for near death experiences with septic shock, recurrent disabling and painful infections despite heavy duty prophylaxis and an aggressive CLL clonal evolution of the dreaded 17p deletion. And I am leaving out huge chunks of her travails. Clearly when she looked at her options a few years ago, it was apparent that she couldn't keep going much longer without more therapy, but her fragile immunity couldn't have tolerated the blows from the chemotherapy that she needed. This has just before our awareness of the promise of the emerging TKIs such as ibrutinib (PCI-32765) and idelalisib (CAL-101) in CLL and at that time, her options were mighty limited. Wanda bravely elected for an allogeneic stem cell transplant, but wisely chose one where there was no chemo! A transplant and CLL researcher that I knew, Dr. David Miklos at Stanford had an innovative small but growing successful series of outpatient allo-transplants for CLL using only very low dose radiation and high dose ATG (anti -thymic globulins) to briefly knock out the recipient's T cells just long enough to sneak the donor cells into the marrow. No immune suppressing chemo is used, not that all the animal antibody of the days of ATG and radiation to the gut is a risk free or pleasant experience. Still it was perfect option for Wanda, as her dangerous period of immune suppression would be both of shorter duration and lower intensity. Steeling her nerves, all in, ready to go for the move up to Palo Alto for the months of therapy and follow-up, her difficult to find perfect 10/10 donor backed out at the very last minute. Emotionally sucker punched, Wanda's knees may have buckled, but ever the fighter that she is, she just got ready to face what ever would be thrown at her in the next round of her cancer battle. Enter the perfect stranger. Or at least a nine out of ten donor. A match made in in heaven. Her transplant hopes were rebooted. More than a year after the HSCT, she found out that this genetic near doppelgänger was a rock solid sweet family man from a small town two hours north of Houston, Texas. Her transplant path since has had its share of scares and joys, but Wanda is CLL and infection free these days. She is living big and is always ready to be more than generous and thankful for the chances she has been offered. Earlier this week, it was my great privilege to join Wanda and her family and friends to celebrate her donor and savior, Aaron and his wonderful young family in her backyard. For those few of us who have had that opportunity to meet and thank the perfect stranger from miles away who's selfless actions have saves our lives, it is one of life's magic moments. We meet someone we probably would never have met. Someone whose whole upbringing and life experiences make have no common points of connection with ours. A path we might never have crossed and a hand we might never have shaken if it wasn't for their random act of kindness that mades us blood brothers. Knowing that we truly are all in this together can change everything. It makes the world bigger and brighter. I am still in frequent contact with my Israeli donor, Yaakov and living in gratitude for his painful and selfless efforts to help a stranger. I remember so well the tears of thanks and the tidal wave of emotion when we first met. The world is a better place because of the work of doctors such as David Miklos (and let me share this celebratory moment with my doctor, Steve Forman, at City of Hope), true heroes such as Aaron (and my donor Yaakov), and survivors such as Wanda. I am lucky to be able to share in these celebrations. My blog started all about my transplant adventure and has subsequently morphed more into my editorials and interviews on blood cancers, and I will write again soon about CLL and other malignancies including the still important role of transplants, but I haven't forgotten my original vision for this blog. Even though my transplant failed, it bought me the time to get to the game changing treatment with ibrutinib that I am enjoying now. If it weren't for Yaakov, my story might have ended years ago. Here is the first part of the official press release on the third breakthrough designation for ibrutinib. This one is close to home. The news is important, not only because it means there is another reason to believe the wonder pills will be in drug store near you next year some time, but because insurance, at least at first, will likely only pay for the designated indications, without putting up a fight. The good news is however limited in its scope. It is only for CLL/SLL with 17p del. I don't know if the percentage of the cells that lack the short (think p for petit) arm of their 17th chromosome has been defined that will be needed to qualify. We know that 17p del tends to play more nicely at lower percentages. Not sure if the FDA gets down to that level of detail and I hope they leave that decision to a discussion between us and our doctors, as we do now when considering therapy. What we do know is that this does not mean breakthrough designation for all of us with CLL. At least not yet. Will it be used off label for others with CLL? Most cancer drugs are and one that in the studies so far appears to be as safe and efficacious as ibrutinib should be no exception. Who pays will be the bigger issues. On a personal note, as one with small population of 17p deleted CLL cells, this is particularly good news, as I would have an option should my trial close or I need to leave it. SUNNYVALE, Calif., April 8, 2013 /PRNewswire/ -- Pharmacyclics, Inc. (PCYC) announced today that the U.S. Food and Drug Administration(FDA) has granted an additional Breakthrough Therapy Designation for the investigational oral agent ibrutinib as monotherapy for the treatment of chronic lymphocytic leukemia (CLL) or small lymphocytic lymphoma (SLL) patients with deletion of the short arm of chromosome 17 (deletion 17p). Patients harboring a deletion within chromosome 17 generally have poor response to chemoimmunotherapy and have limited treatment options. The presence of deletion 17p is one of the worst prognostic factors in patients with CLL. In February 2013, FDA granted Breakthrough Therapy Designations for ibrutinib as a monotherapy for the treatment of patients with relapsed or refractory mantle cell lymphoma (MCL) and as a monotherapy for the treatment of patients with Waldenstrom's macroglobulinemia (WM), both of which are also B-cell malignancies. Ibrutinib is jointly being developed by Pharmacyclics and Janssen for treatment of B-cell malignancies. The Breakthrough Therapy Designation is intended to expedite the development and review of a potential new drug for serious or life-threatening diseases where "preliminary clinical evidence indicates that the drug may demonstrate substantial improvement over existing therapies on one or more clinically significant endpoints, such as substantial treatment effects observed early in clinical development." The designation of a drug as a Breakthrough Therapy was enacted as part of the 2012 Food and Drug Administration Safety and Innovation Act. Pharmacyclics, together with Janssen, is working with the FDA to determine the implications of this Breakthrough Therapy Designation to the ongoing and planned development and the FDA filing requirements for the use of ibrutinib in CLL patients with deletion 17p. The FDA Breakthrough Therapy Designation for ibrutinib in CLL patients with deletion 17p was based on data from pre-clinical and clinical studies where ibrutinib as a monotherapy was used to treat patients with this disease. Ibrutinib has the potential to improve the outcome in this serious and life-threatening disease which has a poor prognosis. In addition, Pharmacyclics and Janssen have recently initiated a Phase II study of ibrutinib in patients with CLL deletion 17p, RESONATE" -17, which is a single-arm, open-label, multi-center trial using ibrutinib as a monotherapy in patients who have deletion 17p and who did not respond to or relapsed after at least one prior CLL treatment (a high unmet need population). The primary endpoint of the study will be overall response rate. This global study opened this year and Pharmacyclics plans to enroll 111 patients worldwide. Another quick break from CLL, this time to commemorate the passing of an era for Canada in general and my extended family in particular, as my cousin Bob Rae steps down as leader on the Liberal Party in Canada. Most of you know that I was born in Canada and retain my Canadian citizenship and also my Ontario medical license, making me a legal citizen and doctor in two great countries. What few of you may know is how much one of my family member has been involved in the highest echelons of Ontario and Canadian politics. Being an only child, my cousin Arlene was a wise and charming part-time older sister to me when I was growing up in the 50's and 60's in Toronto. Years later, Arlene married a young lawyer and politician, and I married an American musician and our lives went different ways. We stayed in touch across the miles and the years as we raised our families and pursued our dreams. The hardest thing about leaving Canada was leaving behind my friends and family. Although now I have lived in the USA for the last 32 years, and I haven't always agreed with my cousins on all things political or about health care delivery, I love and respect their public service, their highest ethical standards, their wisdom, and their pride of country. Bob Rae is a great man. He is certainly the best prime minister Canada NEVER had.